The JC Raulston Arboretum has a very dynamic character as a teaching and research facility. It is intended to meet the changing needs of NC State faculty, the green industry, and the public. Over the years, this character has been particularly apparent in a small area of the Arboretum nestled between the Finley-Nottingham Rose Garden and the Paradise Garden. 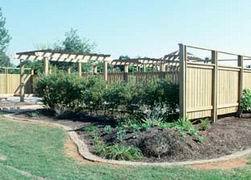 In May 1980, NC State horticulture students constructed a fence to enclose the area. 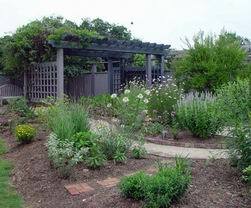 The northern bed was planted with native wildflowers, donated and installed by North Carolina Botanical Garden staff. The southern bed contained edible plants, such as blueberries, small fruit trees, and herbs. This garden space became the Almanac Garden in 1989, providing an outdoor set for the public television program Almanac Gardener. 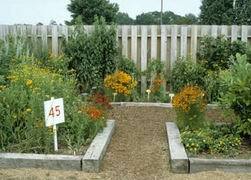 The area was designed by our current interim director Kim Powell and retired NC State extension specialist Larry Bass. New features included the wooden arbor, water garden, and brick-paved walkways. Eventually, Almanac Gardener moved to a studio set and the little garden was adopted by Arboretum volunteer Patricia Highland in 1997. Patricia proposed that the space become a garden for butterflies. The site was perfect: west-facing with a bit of shade and protection from strong breezes. With the goal of bringing movement to the garden and encouraging visitors to recognize their connection with nature, she added plants that invited fluttering wings, such as Chinese abelia (Abelia chinensis) and pipevine (Aristolochia manshuriensis). Patricia also limbed up a large white Chinese fringe-flower (Loropetalum chinense var. chinense), creating a specimen that still attracts attention when it blooms in spring. 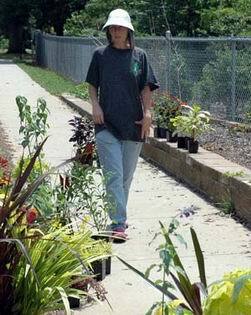 Curatorship of the Butterfly Garden was taken on by Wendy Elliott in 2001. After attending the Carolina Butterfly Society's Butterfly Gardening Symposium, she brought exciting new ideas and plants to the garden. One of these ideas was a chrysalis house, which was constructed by volunteer Wayne Friedrich in 2002. This structure protects the pupae (the immobile stage of the butterfly life cycle), which are placed in the house so that the process of metamorphosis and the emerging adults can be observed. Over time and successive iterations, the garden layout evolved from a sketch on scrap paper to a pair of circular nodes connected by a flowing curvilinear path. The larger circle is completely wheelchair accessible and informal step stone paths accommodate additional foot traffic. 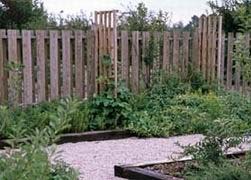 The organic feel of the paths and beds is compatible with the wildflower plantings and naturalistic style of the garden. Several visitors have commented that the path shape reminds them of a butterfly's unfurled proboscis; although this connection was unintentional, the observation certainly supports the garden's theme. Plant selection meets the needs of butterflies and includes herbaceous as well as woody plants. Native grasses that are larval food sources for several butterfly species contribute sound and movement and enhance the relaxed feel of the garden. A diverse array of nectar sources with a long collective flowering period will attract a variety of butterflies across an extended season. These plants are arranged to group flowers of similar bloom times so that exposure of the butterflies to predators when traveling from one source to the next is minimized. Established plants such as the fringe-flower and the golden Hinoki falsecypress (Chamaecyparis obtusa 'Confucius') have been retained. Evergreen inkberries (Ilex glabra cultivars), pawpaws (Asimina triloba), and a sassafras (Sassafras albidum) will provide additional structure for the garden. The chair swing under the arbor is one of the most popular spots in the Arboretum. Although the original water feature was leaking and difficult to maintain, we knew it was important to retain a focal point to view from the swing. We also wanted to separate that space from the primary flow of traffic. We decided to replace the small pond with a larger bog and pond system that would simulate natural conditions that attract butterflies. We reduced the size of the pond, moving it out from under the shade of the arbor, and increased the size of the bog area, planting it with pickerel weed (Pontederia cordata), swamp milkweed (Asclepias incarnata 'Soulmate'), turtlehead (Chelone glabra 'Black Ace'), cardinal flower (Lobelia 'Diva Red Wine'), and sweet pepperbush (Clethra alnifolia 'Compacta'). Since pickerel weed is a marginal plant that tolerates standing water, it was included in the pond as well as the bog. Unfortunately, the sweet pepperbush could not take constant wet feet or did not appreciate the dramatic root pruning at planting and died very quickly. (Wherever Jon Roethling is right now, he's entitled to say "I told you so!") We'll be looking for another compact shrub to add woody structure in the bog. Where the bog transitions to the pond, a sand bar collects salts and nutrients from the water. We hope that male butterflies will congregate near this puddle to gather the salts, which are necessary for sperm production. The sand bar is also very popular with birds for bathing, since the water is shallow and moves relatively slowly. Five-lined skinks (Eumeces fasciatus) soak up sun on the stone edging around the pond and green frogs (Rana clamitans) discovered a new home within two days of the pond being filled with water. With all this activity, I believe that the garden has become one of the liveliest spots in the Arboretum, manifesting Patricia Highland's original vision of bringing us closer to nature. If we remember to spend some time observing the plants and wildlife, I expect that we will experience more than butterflies metamorphosing in this garden. The recent renovation of the Butterfly Garden would not have been possible without the financial support and donations of the following individuals and organizations: Accent on Stone, Blue Moon Garden Design, Wendy Elliott, Ferguson Enterprises, Plant Delights Nursery, PondSweep Manufacturing Company, Southern Water Gardens, Wake Audubon Society, and Bobby Wilder. The invaluable clean-up and construction help of Jared Hoyle, Kim Powell, Sam Powell, and Barbara Kennedy's volunteer group is also greatly appreciated. Special thanks to all for their assistance. Pots, tubs, antique urns, hanging baskets, and window boxes – containers have played a major role in garden design since ancient times. Early Egyptians, Greeks, and Romans used earthenware pots for utilitarian purposes as well as for growing plants, in materials ranging from clay and terracotta to metal, stone, lead, and wood. Today's garden receptacles still incorporate many of these early design products, along with new and innovative materials such as fiberglass, concrete, and reconstituted stone. Such modern technology was used in the formulation of the receptacles that comprise the majority of the JC Raulston Arboretum's collection of container gardens. Composed of a substance called Glascrete, a mixture of polyester resin, fine aggregates, and glass fibers, this material provides a cast stone appearance at about one-fifth its weight. 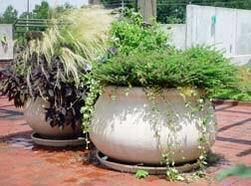 Whether a standard terracotta pot from the local garden center or a Victorian urn from a specialty antique center, containers provide a number of uses in the total garden design concept. They can be employed as design elements unto themselves to create a particular mood or lead the eye to or away from a particular vista. A Mediterranean atmosphere, for example, can be created in the garden simply by employing distinctive vessels and plantings into the landscape. Exotic house plants can be transferred onto a summer patio to create a tropical ambiance – provided they are properly acclimated to the outdoors. 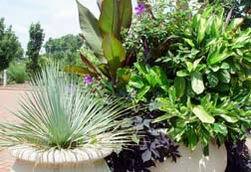 Nonetheless, the primary use of containers is still to hold plants and allow color to be easily placed in the garden where it is most needed. And the larger the planter, the more imaginative and permanent the container design can be. It is important to choose not only the right receptacle – one that blends harmoniously with both the style of the house and the garden – but also the appropriate plants to complement these elements. The style, texture, color, and materials of the container should be a part of the original garden concept and not an afterthought haphazardly dropped into an available empty space. Grouping containers together on a patio, in a dull corner of the yard, or to break up a large expanse of lawn can have a dramatic effect, provided the vessels and the plants they contain are attention-grabbing and work well together. This year's design of the Arboretum's collection of container gardens was undertaken by the mother-daughter team of JoAnn Dewar and Susan Rollins, container garden co-curators, of Fairview Greenhouses and Garden Center in Raleigh. A respected container designer, JoAnn recently designed more than one hundred and fifty containers and window boxes that graced the fairways of this year's U.S. Open Golf Tournament in Pinehurst, North Carolina. According to JoAnn, interest in and demand for container plantings evolved with the increased construction of condominiums and townhouses in our area and the subsequent landscape constraints confronting these homeowners. According to JoAnn, environment is the first and most important element in the design of the container garden. The amount of sun or shade in a particular location should be the overriding factor in determining the selection of plants used in the container. The style and size of a planter are also important considerations in plant selection. Formal, highly stylized containers should be outfitted with more formal and upright greenery that draws attention to the container itself, instead of trailing, spreading plants that conceal it. 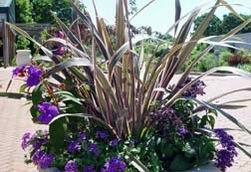 Once the right site has been determined, distinct texture and colorful foliage become the essential factors in creating a successful container planting. These elements will carry the design through the entire season whether flowering plants are in bloom or not. Nonetheless, to keep flowering plants blooming at their peak, continual dead-heading and pruning are essential. This will keep the design from losing its original structure and intent. 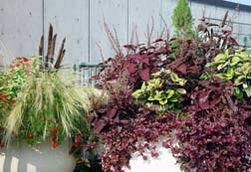 Foliage plants such as coleus and sweet potato vine can provide continuity to container groupings, as do repetition of a particular color or species of annual bedding plants. Finally, trailing vines can soften the edges created by vertical plantings and permanent evergreen shrubs. JoAnn Dewar (right) received no formal training in horticulture or landscape design but grew up on a tobacco farm and learned through trial and error. 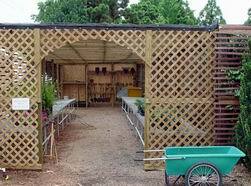 However, today's aspiring container-garden designer can benefit from periodic workshops held at various nurseries and learning centers around the area (Fairview Greenhouses and Garden Center among them) as well as from a number of specialty publications and trade magazines devoted to the subject. 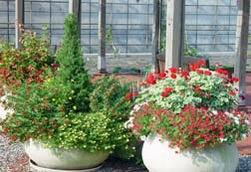 The autumn container design should provide seasonal interest throughout the fall, winter, and early spring months. Dwarf conifers, boxwoods, and many other evergreens can provide permanent, year-round interest in the container garden; however, space should be provided for cold-tolerant herbaceous plants such as pansy, ajuga, and ivy to counterbalance them. Berries can be used as a focal point in the autumn design, as can ornamental grasses such as Pennisetum spp. and Miscanthus sinensis, whose decorative seed heads can supply visual impact well into the winter. Bulbs should be incorporated into the container design at this time for early spring impact. Planting a single species of spring-flowering bulbs can produce a dramatic and colorful effect and eliminate the need to coordinate the unpredictable blooming times of container-planted spring bulbs. A slow-release fertilizer should be incorporated into the fall container planting, and no additional fertilization should be necessary. Despite the seemingly endless design choices, no container or the plants housed in them should be left unattended for too long a period. Container plants are much more sensitive to drought conditions, severe weather, and temperature fluctuations than bedded plants, and care must be taken to provide as stable an environment as possible. Daily watering is required during the heat of late spring and summer and can be supplemented with water-retention crystals. While watering needs are less urgent during the winter months, containers should always be watered before any predicted severe cold spell. Whatever their origin, all vessels, especially antique or used ones, should be thoroughly cleaned before use to remove any existing algae, fertilizer deposits, or bacteria that can be potentially harmful to the plants. This can be accomplished by washing with soap and water followed by a gentle rinse with diluted bleach – one part bleach to nine parts water. Twenty-three receptacles, located in three distinct areas, comprise most of the JC Raulston Arboretum's collection of container gardens. The seven planters in the brick drop-off area adjacent to the parking lot represent the Charlotte and LeRoy B. Martin Parking Circle Container Garden, named in honor of the winners of the 2004 Gala raffle. The fourteen planters located on the rooftop terrace comprise the Tom and Kathy Rucker Roof Terrace Container Garden, named for the Winston-Salem couple who funded them. Two additional containers filled with shade-tolerant plants are located next to the entrance of the Ruby C. McSwain Education Center. The container gardens at the Arboretum were specified in the original design of the McSwain Education Center undertaken by the architectural firm of Cherry, Huffman, and Associates in the early 1990s. They were manufactured by Dura Art Stone <www.duraartstone.com>, a California company specializing in the production of cast stone objects. When visiting the Arboretum, be sure to pick up the informational brochure about the container gardens which diagrams the location and identifies the specific plantings of each container. An interpretive sign is also provided in each planter which lists the identity of each plant in the container. The plants adorning this year's containers came from the Arboretum's own collections as well as from generous donations from Fairview Greenhouses and Garden Center and Campbell Road Nursery, both of Raleigh, North Carolina. The JCRA e-Update is a concise monthly online update sent to Friends of the Arboretum members. It is full of interesting news including upcoming events and new developments at the JC Raulston Arboretum. There are also many electronic links to fabulous pictures and additional information. View previous e-Updates on our Web site at <www.ncsu.edu/jcraulstonarboretum>. Do you want to receive the monthly JCRA e-Updates? If you are a Friends of the Arboretum member and would like to receive the JCRA e-Updates via e-mail, please contact Faye Koonce at <faye_koonce@ncsu.edu> or (919) 513-7457 to update your e-mail address. Receive free Arboretum announcements via e-mail from staff at the JCRA. Stay informed about developments and upcoming events at the Arboretum by subscribing to the Cuttings from the JCRA listserv via the Arboretum Web site at <www.ncsu.edu/jcraulstonarboretum>. All new members are automatically subscribed. Any existing subscribers may change their e-mail address anytime directly from the Web site. Clematis cultivars (clematis) – Mostly deciduous climbing perennials with large flowers that come in many colors. For the container, avoid rampant species. Rosmarinus officinalis (rosemary) – Popular evergreen kitchen herb with upright grey-green needle-like foliage and aromatic leaves. Small blue flowers in early spring. Yucca rostrata (Mexican blue yucca) – Drought-tolerant plant with rigid, sword-like leaves producing attractive bell-like flowers on long vertical spikes in summer. Picea glauca var. albertiana 'Albertiana Conica' (dwarf Alberta spruce) – One of many dwarf conifers appropriate for a container garden. Dwarf conifers come in a wide range of shapes, textures, and sizes and look particularly attractive in groupings. Mature height (in ten to fifteen years) should be a factor determining your choice. Buxus spp. (boxwood) – Whether trained to a formal shape or left to their natural habit, boxwoods make an attractive evergreen foundation plant for the container. Erica carnea (bell heather) and Erica ×darleyensis (Darley heath) – Two varieties of winter-flowering heather. Hedera (ivy) – Any type of ivy, either plain leafed or variegated. Euonymus fortunei 'Silver Queen' (wintercreeper euonymus) – Creamy-white variegated leaves. Carex oshimensis 'Evergold' (striped weeping sedge) – A neat evergreen grass with golden leaves. Viola ×wittrockiana (pansy) – A great colorful addition to the winter garden. Ryan Brandt, Julia Skinner Memorial intern, is a senior in the general horticulture concentration of the Department of Horticultural Science at NC State University. As one of the horticultural interns, Ryan worked in many areas throughout the Arboretum and on several of the large projects this summer including building the retaining wall around The Necessary, bamboo removal, planting the Entry Garden, and the Sculpture Garden renovation. Ryan came to NC State University from Apex, North Carolina. The Willie York Memorial intern, Michelle Hogan, is a senior in the landscape design concentration of the Department of Horticultural Science at NC State University and is from Durham, North Carolina. Her many horticultural adventures at the Arboretum included general maintenance of the collections and several large projects including installing drip irrigation in the Finley-Nottingham Rose Garden, the Sculpture Garden renovation, planting the Entry Garden, constructing the retaining wall around The Necessary, and installing the patio near the Visitor Center. After graduation, Michelle plans on pursuing a career in residential landscape design. Jared Hoyle, North Carolina Association of Nurserymen intern, is from Kernersville, North Carolina, and is a senior in the general horticulture concentration of the Department of Horticultural Science at NC State University. He is also minoring in soil and crop sciences and plans to pursue a Master's degree in chemistry-based soil science after graduation. In addition to performing general collections maintenance, Jared helped us with some pesticide applications since he has his pesticide applicator's license. He also worked on several of the major projects at the Arboretum with the other interns mentioned earlier. Jared and Sam Powell, student assistant, assisted with the Arboretum's booth at the Southern Nursery Association's The World's Showcase of Horticulture® in Atlanta, Georgia. The Bobby Wilder Internship was awarded to Elaine Sisko, a senior in the landscape design concentration of the Department of Horticultural Science at NC State University. The Bobby Wilder intern worked with the interpretation staff at the Arboretum this summer on projects that complement and promote the main themes and current issues of the Arboretum. To this end, Elaine worked on the container gardens producing interpretive signage, an informational brochure, and a newsletter article. She also developed a Perennial Border plant list complete with narrative, photographs, and an interpretive map. In her final project of the summer, Elaine designed and presented plans for the interior and exterior of the newly created Visitor Center. These varied activities were directly related to and enhanced her career goals to become a landscape designer. Elaine is from Hillsborough, North Carolina. Elisabeth Meyer was the Arboretum's North Carolina Commercial Flower Growers Association intern this summer. Elisabeth is a senior botany and English major at NC State University. As one of the horticultural interns, she assisted with the day to day maintenance of the Arboretum. She also propagated some of the plants that were available at this year's Annual Plant Distribution and worked on the Sculpture Garden renovation. Elisabeth is planning on attending graduate school after graduating and conducting plant propagation research. She is from Goldsboro, North Carolina. This summer's Sudden Impact intern was Robert Monk, a second year student in NC State University's Agricultural Institute. His program of study in the Agricultural Institute is ornamentals and landscape technology. Robert spent his summer at the Arboretum pruning, potting up plants, spreading mulch, weeding, and watering. He also helped construct the retaining wall around The Necessary. Robert is from Raleigh, North Carolina, and plans on pursuing a career in the nursery industry. Emily Watanabe is a senior in the general horticulture concentration of the Department of Horticultural Science at NC State University and was our Ben Anderson intern. This internship included both horticultural and plant mapping and records duties. Emily worked with other horticultural staff and interns throughout the Arboretum doing general maintenance and on the Sculpture Garden's renovation. She also assisted Val Tyson, plant recorder, with various bed reviews. Emily would like to pursue a career at a vineyard or at a public garden. She is from Cary, North Carolina. Jared Hoyle, Kim Powell, Sam Powell, and Michelle Hogan (left to right) install pavers under the Zone 8 Greenhouse. This past summer, the JCRA Book and Gift Shop was transformed into a wonderful new Visitor Center to serve Arboretum's increasing number of visitors. After all the merchandise was removed by the NCSU Bookstore, the Arboretum's staff, student interns, a student assistant, and volunteers began putting the Visitor Center together. The shelves offer ample space for informational materials and a new Now Showing area displays plants that are at their peak in the Arboretum. Seeing a need for a second electronic kiosk in the new facility, Bobby Wilder, volunteer, kindly donated a new eMac for this purpose. The Ron E. Doggett Family Information Kiosk has been duplicated on this computer. A new Plant Finder kiosk will be installed in the future to provide access to the Arboretum's collections information. This computer kiosk was made possible with a grant from the North Carolina Association of Nurserymen. "The word" is out regarding our facility rentals. There is increasing interest in securing the York Auditorium for meetings, retreats, receptions, and even weddings. A large number of our clientele are University groups that are looking for something new, eye-pleasing, and removed from the main campus hustle and bustle. Renters outside the University are very excited about finding a location that is serene and beautiful. Almost without exception, during an event, comments are made like: "What a great setting for a meeting,"This is wonderful location," and "Wish I had known about this before." Previously, the Klein-Pringle White Garden was the only garden available for holding weddings. Now there are five additional areas for weddings and/or receptions: A. E. Finley Rooftop Terrace, Elm Circle, Finley-Nottingham Rose Garden, and Southall Lawn (lawn and boxwood collection area). Numerous requests for information are received each week by telephone, e-mail, and persons visiting the Arboretum that have just discover that the JCRA is here. Among the many scheduled weddings, are several this October and April and October 2006. April and October seem to be edging out June as the "wedding month(s)." For more information about rentals or to make a reservation, please contact Faye Koonce, facilities coordinator, at (919) 513-7457 or <faye_koonce@ncsu.edu>. The most visible changes to the Visitor Center have been made under the Zone 8 Greenhouse. Brick pavers were installed to increase the patio's size below the glass roof and a few feet beyond its reach. Benches were installed around the structure's perimeter and several overhead fans now cool the area in summer. The new extended patio and its benches are also doubling as a great place for classes to meet. Keeping with our mission, the redesign of this area has already been used as an exercise this past summer for intern Elaine Sisko, a current design student in the Department of Horticultural Science. Thanks to Jared Hoyle, James Lail, Kim Powell, Sam Powell, Jeremy Rogers, and to Donald Salley and Michael Salley (Kim's brother-in-law and nephew from Lexington, North Carolina) for assistance with the benches. Phil Campbell from Campbell Road Nursery kindly donated the plants under the glass area. The Visitor Center is open Monday through Friday from 8:00 AM to 5:00 PM, Saturdays from 10:00 AM to 2:00 PM, and on Sundays from 1:00 AM to 4:00 PM. Weekend hours are based on volunteer availability and subject to change. During your next visit, stop in and say hello to one of the many volunteers who are staffing this area. Goober Would Say "Thank Ya, Thank Ya, Thank Ya!" Once again the JCRA and Mother Nature managed to work together to provide a spectacular day for the 2005 Gala in the Garden. Sunday, May 1, was the date of the big event, and everything was perfect – the weather, the decorations, the guests, the auction items, and the refreshments. This year's honorary chairs, Annabelle and Lew Fetterman, and chairs, Bev and Ron Gelvin, worked both behind the scenes and in the trenches to help make this a most successful Gala. The Gala Committee, listed below, began work in November and spent many hours on the preparation. The Corporate Sponsors came out in full force with unbelievable support again. What would we do without them? They, too, are listed below and I encourage everyone to support the businesses listed and to offer your thanks to these wonderful folks and businesses as you see them or frequent their facilities. 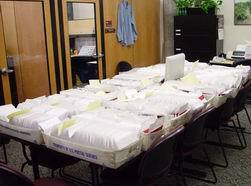 I could never forget to mention the hard work of the JCRA staff in making the job of Gala preparation so much easier. I always know I can fall back on my co-workers at any time. The College of Agriculture and Life Science Advancement Office staff also gets a big thank-you for their help with the auction result calculations. And volunteers! A huge number of volunteers helped in every way possible to make sure the JCRA looked wonderful, the event went smoothly, and everyone had a great time. Couldn't do a Gala without them, either! I must also mention the guests who took time on their Sunday afternoon to visit the JCRA and party. What a fun, eclectic, and lively crowd! Many people treat the Gala as the kick-off to the spring social calendar and this certainly seemed the case. Everyone was in their garden party best and, as there was no repetition of last year's storm (thank goodness), managed to not get covered in mud. The food and beverages were again top-notch and were enjoyed by all. This year's dessert social was such a terrific success that some folks actually missed the goodies – watch for a change in next year's format that should keep that from happening again. A new idea for decorations for this year's Gala was to hold a container garden contest just prior to the Gala and to use the container gardens as both a part of the decorations and for the silent auction. The container gardens judged as the top three best were auctioned by our good friend, Rufus Edmisten, at the dessert social. Thanks to all the participants in the contest. Each container garden was unique and all were beautiful. A few years ago during the last part of the Gala, I was asked to give impromptu remarks. I remember at that time thanking everyone for being at the Gala and saying, "No one wants to give a party and have no one attend." I say that again and thank you all for helping in ways too numerous to mention. Gala in the Garden was also a monetary success. I'm proud to announce that we netted a profit of just over $78,000.00! Here are just a few of the folks that helped out. If I've forgotten anyone, please forgive the oversight and know you're no less appreciated. North Carolina Agricultural Foundation Inc.
Gilmore Plant and Bulb Co. Inc.
Goddin Landscape and Maintenance Inc. Contemporary Publishing Co. of Raleigh Inc. If you need a gift for a graduation, wedding, or anniversary, be sure to consider either a brick paver or a garden bench – both engraved with the message of your choice and placed in the JCRA walkways or gardens. Contact Donna Walker at (919) 513-3826 or <donna_walker@ncsu.edu> for more information. For more information on sponsoring an internship, please call or e-mail Anne Porter at (919) 513-3463 or <anne_porter@ncsu.edu>. 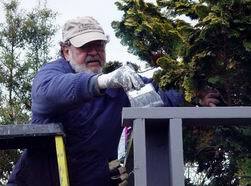 Two thousand six marks the 30th anniversary of the JC Raulston Arboretum, and there are big plans to celebrate the life and legacy of J. C. Raulston. From the Gala in the Garden on May 7, 2006, to a JCRA symposium in late September 2006 and many other special trips, lectures, and events, it will be a year to remember. A 30th anniversary symposium will be held on September 22, 23, and 24, 2006, and Roy Lancaster of England will be the highlighted keynote speaker. 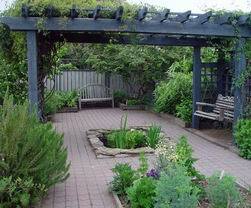 Additionally, the JCRA will be featured in the 2006 Garden Conservancy's Open Days garden program. Much more information will be coming soon for all the 30th anniversary events. Watch for many more surprises to be announced over the next year! If you've already joined at a lower level and would like to receive these wonderful plants, merely send in a check to raise your previous membership level to the higher level. To be eligible for the 2005 year, your donation must be received by November 30, 2005. Contact Donna at (919) 513-3826 or at <donna_walker@ncsu.edu> for more information. Includes cash, appreciated property (stock, real estate), or tangible personal property. Many gifts from active or retired employees qualify for matching gifts from their employers. Please check with your employer – this could double your gift! Donors pay no capital gains on the increased value with their gift of stock or other appreciated real estate. You may specify the JC Raulston Arboretum as beneficiary of an existing policy, or you may make a pledge by purchasing a new whole life insurance policy and naming the JCRA as the recipient. For more information on these giving opportunities, please call or e-mail Anne Porter at (919) 513-3463 or <anne_porter@ncsu.edu>. For more information concerning any of the Arboretum's events, please visit the Arboretum's Web site at <www.ncsu.edu/jcraulstonarboretum> or call (919) 515-3132. "Gardens, Grottos, and Gelato: A Tour Through the Gardens of Italy"
Join Robert McDuffie as he shares la dolce vita from the summer of 2005. He journeyed from Sorrento to Como and along the way photographed a dozen of Italy's finest gardens. Robert is an associate professor of horticulture at Virginia Tech where he teaches classes in computer-aided design, site scale and residential landscape design, landscape construction, and the history of landscape architecture. "Living the Quiet and Riveting Life of a Gardener: At Home with Elizabeth Lawrence"
Emily Herring Wilson, author of Two Gardeners/Katharine S. White and Elizabeth Lawrence: A Friendship in Letters and No One Gardens Alone: A Life of Elizabeth Lawrence, will bring her vivid sense of story-telling to a presentation of the life of Elizabeth Lawrence, named by Horticulture magazine as one of twenty-five of the "world's best" gardeners. Emily Wilson will introduce Elizabeth Lawrence to those who do not know her already, and add new insights for readers already familiar with her life and work. Elizabeth Lawrence lived and gardened at 115 Park Avenue in Raleigh for more than thirty years, until she and her family moved to Charlotte in 1948. 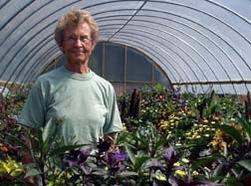 Plants from her Raleigh garden were rescued by Edith Eddleman and planted at the JC Raulston Arboretum. Raleigh author and preservationist Catherine Bishir calls Emily's biography "beautiful" and "riveting." The New York Times calls Two Gardeners/Katharine S. White and Elizabeth Lawrence: A Friendship in Letters "one of the best gardening books in years." Emily Wilson, who lives and gardens in Winston-Salem, is the co-author with Margaret Supplee Smith of North Carolina Women and other books, and is a frequent lecturer and workshop leader. Two Gardeners/Katharine S. White and Elizabeth Lawrence: A Friendship in Letters and No One Gardens Alone: A Life of Elizabeth Lawrence as well as Elizabeth Lawrence's books will be for sale after the lecture. "Tiptoeing Through the Tulips with You: Flowers, True Love, and Popular Songs"
Tracing back at least as far as the sonnets and songs of the Renaissance, flowers have played an essential role in the profession of love. They remain a richly suggestive and varied part of the familiar imagery of popular songs, where lyrics return again and again to tulips, violets, daisies, and roses. Their depiction shapes the song's emotions and attitudes. In the process, they give us insight into how popular songs reflect the beliefs, desires, and dreams of their time as they turn the familiar into the memorable. Kevin Moss, Community Outreach Coordinator for Cornell (University) Plantations, wrote, "Michael Lasser is an engaging, astute, and articulate speaker.... His presentation is at once enlightening and entertaining, amusing, and serious, light hearted and poignant. Added to this is Michael's deep passion and enthusiasm for the subject.... Using recordings of popular tunes to illustrate his talk, he adroitly describes the ways in which popular music uses botanical references to reflect the social and emotional context of its day.... As he artfully interprets the music of the time period, he offers deep insight into the hearts and minds of the people who lived it in a way no history book can ever teach." "Creating the Tropical Look with Hardy and Tender Plants"
Have fun and celebrate (the heat and humidity of) summer by creating a tropical garden. Do it the easier way and build it on a backbone of winter hardy tropical-looking plants such as hardy palms, bananas, and many others. Be surprised by a number of unexpectedly hardy plants. Flesh it out with a wide range of irresistible tender treasures. NC State Floriculture is part of a national poinsettia program that tests poinsettia cultivars to determine which ones are best for consumers and for producers. You will have a chance to see these cultivars yourself and vote for your favorites. Over 110 different cultivars of poinsettias – including new experimental cultivars – will be on display. Stop by to see our famous 9' tall poinsettia tree and other displays. Help us decide which poinsettias are North Carolina's favorites. "Some Like It Hot: Sizzling Tropical Plants for Containers and Borders"
Reveling in our hot, humid summers and mild autumn months, tropical and sub-tropical plants perform beautifully in North Carolina gardens, providing months of flowers or colorful foliage (or both!) and growing vigorously right up until fall frost. From tiny jewel-like cupheas to towering bananas, easy-to-grow tropicals stretch the textural palette to its limits, while also pushing color boundaries with their often incendiary tones. Singing Springs Nursery owner Pam Baggett shows you the best tender and hardy tropicals for borders and containers, and offers insights on incorporating them into your garden. With all the winter delights at their peak, join us for an exciting presentation followed by guided tours at the JCRA. Magnificent Japanese flowering apricots, witchhazels, hellebores, conifers, hollies, winter honeysuckles, and many more plants will be showcased. Light refreshments will be served. Self-guided tour brochures will be made available at the Arboretum throughout February. March 25 and 26, 2006 (Saturday and Sunday) – Entries on display and tours of the JCRA highlighting plants that attract birds. Details coming in early 2006. Offering rare and unique annual, perennial, and woody ornamentals. Proceeds benefit horticultural scholarships and area nonprofit organizations. For more information, contact a Pi Alpha Xi member at (919) 515-3178 or visit <www.ncsu.edu/project/pialphaxi>. Join us for a delightful spring afternoon with cocktails, gourmet hors d'oeuvres, live music, and a silent auction featuring a plethora of unique plants and an eclectic array of many other distinctive items. If you are a member of the Friends of the JC Raulston Arboretum, we have a reciprocal agreement with the Sarah P. Duke Gardens. You are entitled to their member's rate if you attend any educational program they offer. Just present your JCRA FOA membership card and they will honor it as their own. Visit <www.hr.duke.edu/dukegardens> for their program listings. It has been a busy season and the JCRA is still full of color. The gardens were just fabulous all summer even with the times that rain drops were just a distant memory. The staff, student interns, and the volunteers pulled together, making all of this possible. Volunteers have been working all season, sharing their time and talents, as you will see in the report. Come visit and see for yourself! Collaboration means "to work together, especially in a joint intellectual effort." 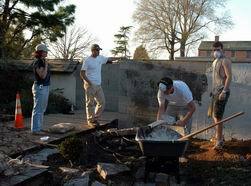 The renovation of the Butterfly Garden was a true collaboration involving many folks, both staff and volunteers. Bob Davis, aquatic gardens curator, discusses the water feature design for the Butterfly Garden with Wendy Elliott, Butterfly Garden curator (right). John Pelosi (right) shows his determination as part of the team that painted the fence in the Butterfly Garden. The other painters that are not pictured included: Bob Davis, Annie Hibbs, Barbara Kennedy, Charlie Kidder, Janet Riddle, and David White. Thanks so much for everyone's help. Anne Spafford's Landscape Construction Studio (right) put their classroom knowledge to work while enhancing the beauty of the JCRA. The class constructed the entrance to the Japanese Garden. Pictured left to right: Anne Spafford, Tom Murray, Tod Odea, and Cliff Reid. Not pictured: Gabe Martin (teaching assistant), Jessica Kohls, Tim Webb, Patrick Bumgarner, and Daniel Futrell. 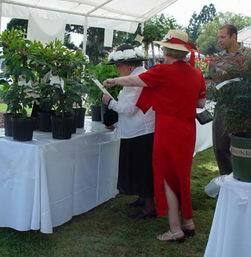 The 2005 Gala in the Garden was a great success! A major factor in that success was the 300+ hours volunteers contributed. The Gala invitation mailing that kicked it all off (right) was the handy work of Bill and Libby Wilder. Tim Hinton, JCRA volunteer, advises Ruby McSwain and Anne Blakely on a Gala silent auction plant in the photograph below. Kudos to all of the volunteers that contributed to this success. The success can be measured by the fun everyone had as well as the significant financial gain for the JCRA. The Tuesday evening gardening team has been faithfully meeting just about every week since April. The team weeds, prunes, divides, and pots up plants for the nursery. This gives the office-bound a gardening volunteer opportunity. 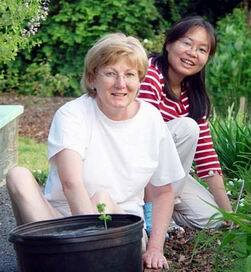 The weeding duo pictured below are Sandy Reid and Qian Wu. Pam Baggett (right), Entry Garden curator, carefully places the plants from her nursery, Singing Springs Nursery, in the garden that greets folks visiting or driving by the JCRA. Thanks for the show, Pam! The containers that grace the roof top and the entry area of JCRA (right) complete the garden look, thanks to our new container gardens co-curators, JoAnn Dewar and Susan Rollins. 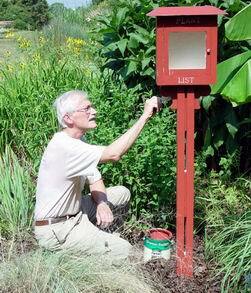 Wayne Friedrich put his woodworking talents to work again for the Arboretum. Wayne is putting the finishing touches on the plant list box he built for the Perennial Border in the photograph below. Kim Powell, interim director, and James Lail, horticultural technician, along with the student interns, built a work area just for the garden volunteers (right). 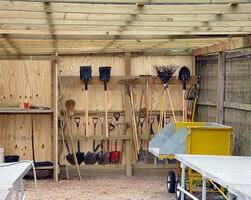 The area provides for storage of tools, supplies for potting, and lots of bench space. 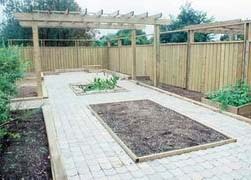 Part of the area is even covered and is central to all gardening activities – just beyond the Lath House. Thanks, gang!